Come and see a spectacular circus show and meet Santa this Christmas at Squire’s Garden Centres. 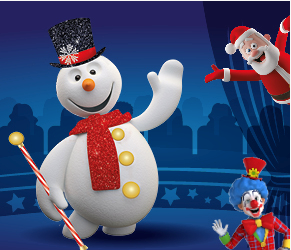 The circus stars Frosty the Snowman, who has always been a big fan of the circus, but unfortunately he has no circus skills! Come and see Frosty as he causes mayhem in his quest to become “The Greatest Snowman”. Feel the magic up close as you’ll have a ringside view of Frosty and the jaw-dropping acts, which include aerial acrobatics, knife throwing, solo trapeze, sword and dagger balancing, plate spinning, a laser light show and the wheel of death (acts vary by centre). It’s fantastic entertainment for all the family. The circus is held in a Big Top in the grounds of Squire’s Garden Centres in Badshot Lea, Shepperton, Stanmore and Washington. Plus after the show each child will meet Santa and receive an early Christmas present from him! Tickets for “The Greatest Snowman” cost £13 or £14 per person and under 2’s go free. There’s also a Traditional Circus at Squire’s from 27th December to 1st January (excludes Shepperton), and tickets are just £10 per person. Book online now at www.squiresgardencentres.co.uk. Save 10% if you book by 31st October, or when booking a group of 10 or more. The show lasts approximately one hour and is brought to you by John Lawson Circus. This is an all-human circus – no animals are involved.